Matthew Rothschild, is the editor of Progressive magazine. He is also known for writing You Have No Rights: Stories of America in an Age of Repression. This Saturday, February 2nd, The Progressive will be presenting, The Untold History of the United States. 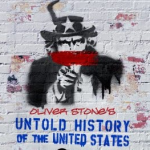 It will be an evening with famous director Oliver Stone and historian Peter Kuznick. Matthew came by to talk a little bit more about the exciting event.